There are different ways to hold the guitar with the left hand (or the right hand if using a horizontally mirrored guitar). No method is the only correct way of holding the guitar, but there are two predominant styles. The classic position that can be seen to the left on the picture above is recommended by many guitar teachers – it is somewhat of the scholar approach. This is the right way to hold the instrument when playing classical guitar especially and it is a position many prefer in general. This position is what most guitar teachers learn. The thumb is placed in the middle on the back of the guitar neck. 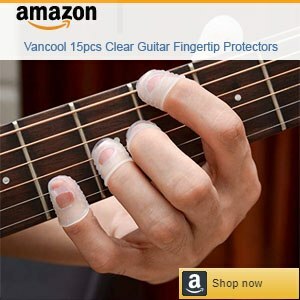 The practice here is that only the thumb and your fingertips should touch the guitar. Economy – try to switch from a bar chord to an open chord or from a power chord to open, and you will only need very little movement if you are holding the thumb on the back of the neck. Reach – compare different positions and you will notice that it is best for the hand to be in a horizontal position along the fretboard, and this will happen with the explained grip. Embellishment – it is easy to use other fingers for embellishment. Pressure – you don't want to press the fingers too hard against the strings. Now try out for yourself and see what you think. It is also important to feel comfortable when playing guitar, and not force yourself to something you don’t like. Extra possibilities for bass notes – to have your thumb near the sixth string could come handy for playing the bass notes. Muting strings – the thumb could be used to mute the top strings that shouldn't be played when strumming chord. 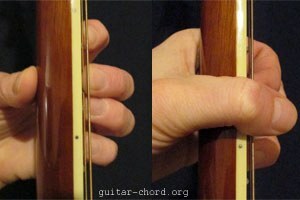 A fifth "finger" – by involving the thumb you could achieve specific chord shapes. Steadiness – for some, this left-hand position makes the playing more steady and stable. To summarize and generalize: holding your guitar in this manner is especially suited than playing western guitar, whereas the other alternative may be more optimal when playing classical guitar.